My girl crush on Erica O’Brien was documented here (and here and here) long ago. So you will not be surprised to find out that, as I was getting my feet wet on Pinterest today (I know…where have I been?? 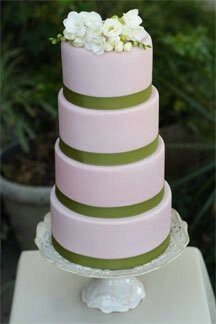 ), one of the first cakes I pinned, without even knowing it, was one of Erica’s pretty cakes. Oh, there is just something about the way she works! Everything is so clean and uncluttered, so original and crisp. When I went to research this cake, I of course found three more that I love LOVED. Look for those over the next few months. This gem is palest pink with an earthy, silvery sage green ribbon at the base of each layer. On top of the cake is a beautiful spray of white flowers. While I can’t say for sure, It seems that the cake is diminutive in stature, since it appears to be on a small-ish cakestand. The difference in size between the layers is only one inch, making for a statuesque and grand cake, even though it is small. I love it. See more of Erica’s beautiful work by visiting her website.